The Brownlow Festival Committee, who organise the annual Brownlow Festival held a cheque presentation ceremony last week to celebrate the committee’s fundraising efforts. 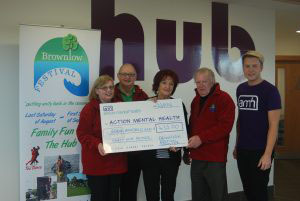 The festival’s designated charity this year was Action Mental Health (AMH). Over 1000 visitors enjoyed taking part in the week long festival which ran from 27th August to 3rd September. The extensive programme of activities included a fantastic fun day at the Brownlow Hub, an art exhibition, a relaxing picnic at Moyraverty Centre; a nostalgic vintage tea dance and a tasty cookery demonstration! Generous attendees made donations which amounted to an impressive £435. Specifically, the festival organisers were keen for the money raised to be spent locally to highlight and support this important cause. Fittingly, AMH Fundraising and Events Officer, Callum Clark announced that the funds would be allocated to the charity’s ‘New Horizons’ Service in Craigavon and Banbridge. Callum stated “We cannot thank the members of the Brownlow Festival Committee and its visitors enough for choosing Action Mental Health to benefit from their efforts and kind donations”. He continued, “AMH New Horizons helps people to overcome the effects of mental ill-health and in many cases return to work. Our Craigavon and Banbridge Service offers a range of recognised qualifications, training, personal development programmes, social and recreational activities. This donation will benefit local people who are on the path to recovery from mental ill-health”.